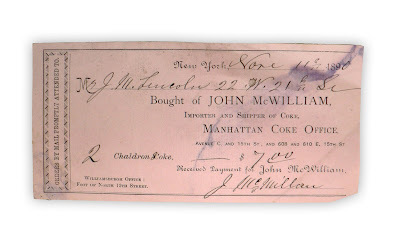 Receipt, dated November 11, 1890. 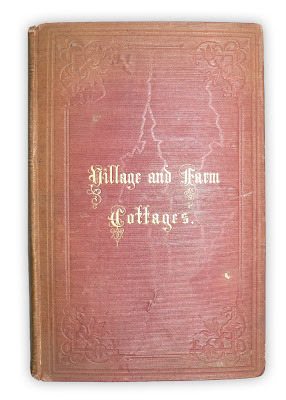 Found in "Village and Farm Cottages" by Henry W. Cleaveland, William Backus and Samuel D. Backus. Published by D. Appleton, 1856. ED: in case you are interested, coke is "the solid residue of impure carbon obtained from bituminous coal and other carbonaceous materials after removal of volatile material by destructive distillation. It is used as a fuel and in making steel." John McWilliam who was a sensitive, winsome but keen and capable person with a subtle sense of humor, was able to adapt himself to the household, and the group were happy together. he was fair minded and of sound judgment. He was quick to see the humorous side of things, enjoyed life and liked to meet people. His personality attracted others who admired and trusted him. He was most charitable, giving quietly to those in need, a ton of coal here or a $10.00 bill or clothing for a family there. However, despite his great generosity, he left his wife an appreciable estate when he died. At the time of John McWilliam's marriage, he with a partner was operating a building business from his own shop. However, circumstances brought it about that he had to give up his own business to operate for his father-in-law. It appears that John Smith had gone on bond for his step-son, William Dodd, who with a partner had contracted to open up Eight Avenue. These partners, however, neglected business and were about to fail. In order to save himself, John Smith had to take over the contract. Horses, carts and paraphernalia, and fulfill it. This led to his becoming a contractor. there developed a successful coal and coke business for John Smith. Subsequently, he was taken ill and then decided to retire. His son-in-law, John McWilliam, continued to operate the coal and coke business in which in turn his son, Robert McWilliam, was later associated for many years.